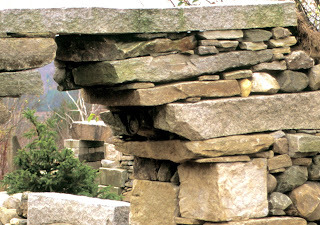 This is the eighth in a series of ten short essays on the design and stone work I did on Rice Mountain for the Berg family over an 18 year period beginning in the late 1980's. If Mrs. Berg’s gardens can be thought of as a series of paintings, then their frames are made of my stone work. Sometimes the frames exceed the size of the paintings but the brush strokes that define the compositions of color, texture and form are made with living things. Gordon painted his pictures on pre-framed canvases. His art making went far beyond one single moment of creative inspiration. He painted his way into the past by composing around and through what was already there, and painted his way into the future by applying pigments that are alive, and continue to grow. Gordon and I had independent visions that became interdependent realities upon the completion of our labors. A visitor may drink in the total experience of the gardens while at the same time tasting horticultural and lithicultural details. In some garden areas one can be pleasantly overpowered by stone, while in others, delightfully smothered in foliage. Differences can be divisive but in the case of Mrs. Berg’s gardens differences unite into an amalgam of outdoor pleasure. 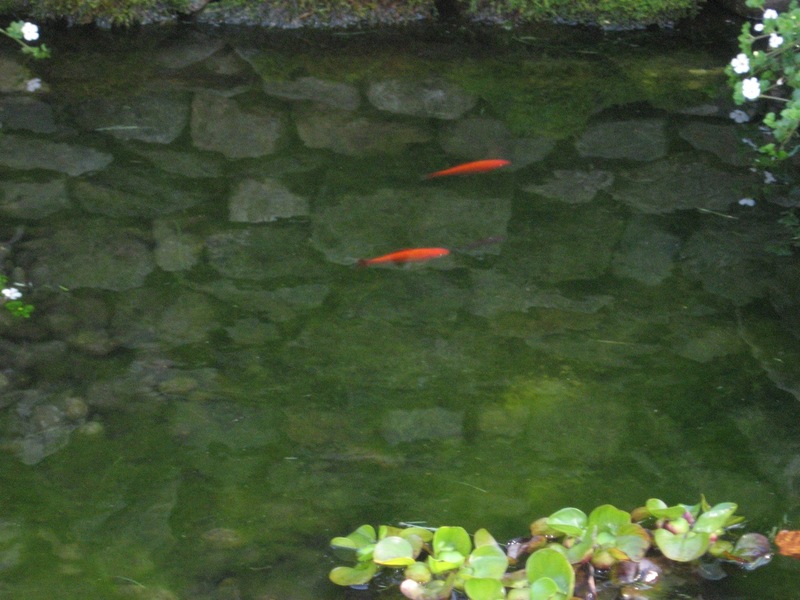 If there is one criticism of the gardens it usually derives from the dizzying effect their variety has on those who attempt to take them in, all too quickly. Wrought iron rings of old hitching posts hang in the threshold archway of the barn foundation. A wide-eyed frog sits motionless up to its chin in a shallow pool along the ruin’s water course. Oyster and mussel shells carpet the floor of the grotto’s dark cavern, the midden of many Berg family meals. Overhead, a tree’s bare root system hangs from the ceiling like a ghostly candelabra. In the Monk’s Brewery foundation a single stone, as long as three acolytes lying head to toe, outlines the base of a wall that might have been. Across the floor, in a wall well suited to a monk’s cell, light passes through a leaded glass window. At a high point in the gardens the trunk of a crab apple tree squeezes its way through the hole at the center of an old grist mill stone. 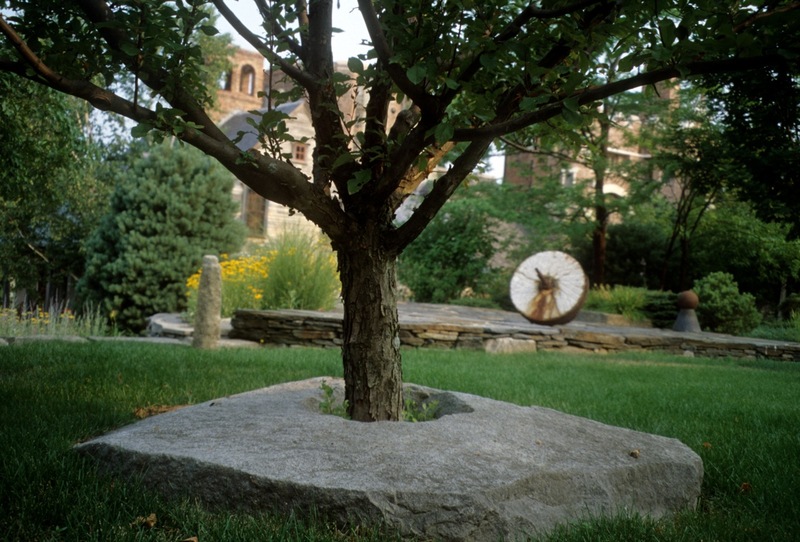 Two terraces below the granite-ringed apple tree, next to the gardener’s shack, another pierced stone adorns a cylindrical tower of mountain stone. No water bucket has ever been pulled up through the opening. This folly of a well is filled with rocks.